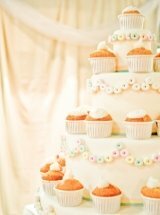 A Wedding Cupcake Tower adorned with fresh flowers or ribbons will become the center of attention at any wedding. The different heights of the tower will show your cupcakes off to perfection. A cupcake tower, or wedding cupcake tree, are available for hire at many bakeries or baking supply stores. Alternatively, you can buy your own tower and decorate it to match the color theme of your special day. An inexpensive and stunning tower can be made by purchasing a cardboard tower, spray painting it in a non toxic paint and attaching ribbon or fabric to the edges. The ribbon can be attached easily, quickly and relatively cheaply by using double sided tape or a hot glue gun, if available. The ribbon covers the cut edge of the cardboard and makes the stand look so professional and so much smarter than what you originally purchased. Nobody will believe when you say you transformed it yourself! A very impressive stand can be made by covering your cardboard tower in fabric and draping the fabric with a matching or contrasting riboon. This creates a classic and simply stunning tower. Another easy option is to purchase cakeboards in graduating sizes and transform them into your cupcake tower. Once again, you can decorate the edges of the cake boards by attaching ribbon to complement your wedding theme. All you need is to make the central tower that each cake board will sit on. This can be done by stacking and gluing styrofoam discs together until you reach your desired height. However, the easy option is is use tins of canned food and cover the sides in paper or ribbon to match your completed cake boards. Tins are a great weight which will prevent your cupcake tower from toppling over. These covered tins will then need to be glued top and bottom to each cake board to make the tree sturdy. The bottom cake board will need to be placed on a smaller tin as you will want it suspended off the ground but it doesn't need to be very high. Don't have time to make a Wedding Cupcake Tower? There are some wonderful cupcake towers available to buy. Here are a selection of my favorites.